Chloé is one of those brands that just makes me feel old. Old enough, at least, to remember a time when Karl Lagerfeld was the house designer and when the signature Chloé fragrance was a powerful white jasmine-tuberose perfume in a bottle topped with beautifully sculpted, frosted-glass floral forms. Sometimes it's hard for me to remember that today's Chloé is a ribbed-glass square bottle containing a sheer peony-lily-magnolia scent. Just yesterday, Robin posted a quick poll asking everyone to "recommend a perfumista-worthy inoffensive, 'light & fresh' office-friendly floral." I'd nominate Chloé. And now we have a pink-tinted flanker, Roses de Chloé. It was developed by perfumers Michel Almairac and Mylène Alran, and it is being described as "an invitation to tenderness" with notes of bergamot, magnolia, rose, white musk and amber. (No jasmine, no tuberose, and certainly no Karl.) Although it was launched in September, I didn't have a chance to try it until it arrived at Sephora last month; meanwhile, I just looked at the ads, featuring a trio of virtually identical young women with gleaming hair and dewy skin, and wondered what reaction I'd have to this newest mainstream rose fragrance. Basically, Roses de Chloé is a simple, streamlined, spring-y rose without any darkness or complications. It begins with a fruity lychee note. There's something just a little bit fizzy going on, and then the rose dominates. It's an upbeat, perky rose, not a dramatic or mysterious one, but that's just what was advertised, so I can't complain. The base is a blend of very smooth, transparent amber and a very sheer, just-out-of-the-shower musk. Roses de Chloé has a surprisingly slow development, as well as good staying power for its composition. The rose stays around for longer than I expected, and a faint dry down was still on my skin at the end of a full workday. However, the fragrance never quite became part of me, if you know what I mean; it just seemed to stay on the surface, like a piece of clothing that didn't quite fit. If you enjoy Diptyque Eau Rose or Caron Délire de Roses, you might like Roses de Chloé too. Then again, if you already own Eau Rose (as I do) or Délire de Roses, you probably wouldn't bother to add something similar (but even less distinctive) to your collection. And if I had to recommend a rose fragrance from a department store, I'd stick to Stella McCartney Stella (which recently had its 10th anniversary! ), while for a recent pink flanker, I prefer Balenciaga Paris L'Eau Rose. There's nothing wrong with Roses de Chloé; it just smells a bit linear and frictionless and, yes, slightly too young for my taste. Then again, the See by Chloé line would probably make me feel downright decrepit. 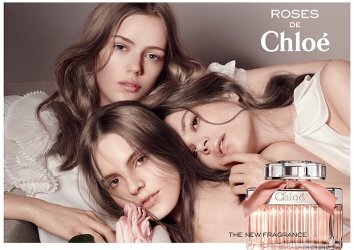 Chloé Roses de Chloé is available in 30 ($70), 50 ($95) and 75 ml ($120) Eau de Toilette and in matching bath and body products. “virtually identical young women with gleaming hair and dewy skin”….all extremely white, young, and skinny. Apparently they have a very narrow idea of their target market, and it turns me right off. Judging from ad photography, though, that’s the target market for pretty much EVERY perfume. OK, a handful of Italian perfume houses are going for extremely suntanned white, young, and skinny. There really is a certain same-ness to the imagery for most mainstream perfume launches, isn’t there? It bores me, but it must be working, or else they wouldn’t keep doing it! I do like the newer Chloe edp well enough to wear when I need an inoffensive floral to wear to TA, as my usual fare was not deemed student friendly by the professor. (but I get compliments on Chloe a lot :/ ) I smelled this a couple weeks ago and even reviewed it but I honestly couldn’t remember what it smelled like, even with a gun to my head. I wonder how this Prof knew what scents were acceptable to the student body (who are usually quite diverse). Perhaps it was just him who didn’t like what you were wearing. It was actually hypnotic poison. I am still not sure what was wrong with it, I am not an oversprayer since I just use usually one or two sprays. The prof just said that it might be a bit much and to ‘go for something more floral’. Btw the prof is a woman, I don’t think any of the male profs would feel comfortable enough advising me on perfume and makeup! “An invitation to tenderness.” Where are the fluffy bunnies and puppies? I also started thinking of tenderness as in bruised/injured body parts, or tenderness as in cooked meats… I know, it’s a weird phrase! They all look about 13, that’s just weird. They are awfully young, like so many models! What especially annoys me about those virtually identical young women is that they all have straight hair. Sounds trivial I know, but my young daughter, aged 11, has crazy curly hair. All the images of ideal girlhood beuaty she sees in the media, advertising, TV shows involve girls with long straight hair. I see them in the mall too, all trying to look like Barbie dolls. My daughter will never conform, and while that makes ME happy, I wonder what it’s like for her. Of course I keep encouraging her not to feel bothered, we don’t all have to look the same (smell the same!) etc. So far she’s fine; she loved that Disney movie ‘Brave’, the Scottish one, where the heroine has crazy curly red hair (Neridah was it?). There are not too many models out there like that. Just show your girl any film from the 80’s, when everyone was perming her hair to have tight curls. No doubt your daughter’s time will come around again. Yes, it is seems so strange that straight hair is fashionable now. First time in my lifetime! I remember those 80s perms very well indeed! hah! I know exactly what you mean. I have curly hair, and I spent the 90s trying to brush and blow it straight every day. I felt so much freer and happier with the way it looked when I started wearing it “natural,” but I had to get to that point on my own, and it took a while. Silly, when I look back! I do think there are better products for curly hair now, and a *little* more latitude about how hair “should” look… but still not enough. I’m always pushing the naturally-curly agenda. Thanks MissElaineous, I did just that, and am very impressed. I especially like her mother’s words: ‘you can’t eat beauty, it doesn’t feed you’. It sometimes disturbs me a bit that Chanel has a ‘whitening’ range among its skincare products. When I see the whitening things in Chanel I think of the slightly older Chanel customer who saw a bit too much sun in her younger days and is now paying the price with sun damage and age spots. Somehow the word whitening has a better sound to it than age or liver spot correcting does. I have no doubt that the “whitening” range is simply Chanel catering to the existing demand for such products among its customers in Asia. Yes, that must be it. And of course Chanel herself made outdoorsy pursuits more fashionable. It’s a complex issue. Where I live people have received the skin cancer message so strongly that they are now vitamin D deficient because of lack of sunshine. I don’t like this perfume. I don’t know what it is but I just don’t like it. I also prefer the old version of Chloe to the modern version. I do like Love, Chloe. Isn’t the simple variation of taste so interesting. I agree pretty much entirely with Jessica’s review in terms of this being simple to the point of being facile, and the sort of thing that wears more on top of your skin than in concert with it–and yet I actually prefer this to both Stella and Balenciaga Paris L’Eau Rose, or even the Diptyque. I can’t say it’s ‘better’ than the Diptyque or even the Stella (I can’t really remember the Paris L’Eau Rose other than not caring for it), but there were features of each of those that didn’t suit me (the citrus felt too sharp in the Stella; the Diptyque feels–ugh sorry for lack of a better word–“old fashioned” to me), whereas the Roses de Chloe just feels agreeable to me even if it has very little else going for it. I don’t really know why, either! It’s *definitely* a matter of taste — and there are such subtle shadings of taste! Nothing wrong with a fragrance just feeling “agreeable” to a particular person, either. I have a tough time with roses. There was something in this that was really sharp to my nose. I think Stella is sharp too. Good thing there are plenty of roses out there for all of us. I agree that taste does factor into it as well as does skin chemistry. I’ve loved perfumes on others that were awful on me.